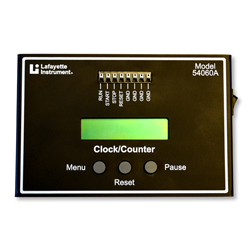 The Economy Clock / Counter is a timing device that is capable of accurately recording times down to the millisecond. This device is powered by a single 1.5 volt AA battery, and a small micro is employed to provide all the operational needs of this device. All of the switch contacts can be configured for Normally Open or Normally Closed contacts, adding versatility to the device. This unit can display times up to 999.999 seconds before roll-over of the display occurs, and can display up to 9,999 count inputs before roll-over occurs. The device has individually configurable inputs, it will work with contact closures, logic levels, and IR triggering systems. All the inputs are diode protected with 1N914's, whose breakdown voltage is rated at 100 Volts. We recommend a maximum rating of 30 volts DC, and absolutely no AC voltage applied to the inputs.